There are going to be more meteor showers this month than the nights we will be willing to step out into the dark and cold to count the shooting stars. 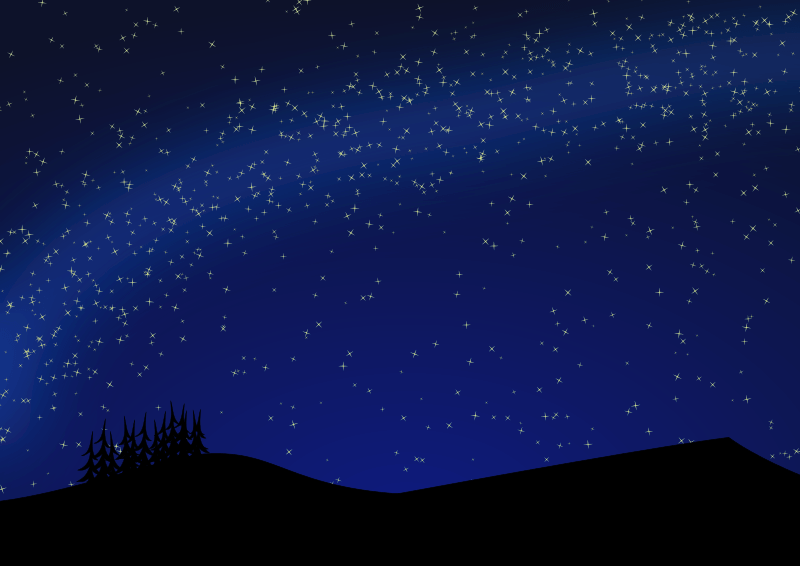 The best thing about meteor showers is that you don’t need any special equipment or training to watch them. Just warm clothes, a dark location and patience. A lot of it! But before we tell you all about the upcoming December 2018 showers and where they come from, let us remind you about one thing that can get in the way of successful meteor observations. The Moon! The lunar dates for your diary are: December 7 (New Moon), December 15 (First Quarter) and December 22 (Full Moon). Now let’s learn all about December showers and their weird parents! One of the strongest and the most reliable showers of the year is the Geminid Meteor Shower that illuminates the sky every December 4-17. The Geminids will peak on December 13-14 when we expect to see up to 75 bright meteors every hour. 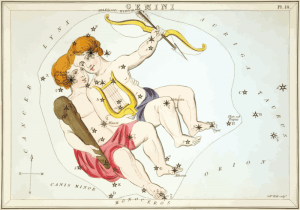 As the name suggests, the radiant of the shower lies in the constellation Gemini, the twins. You can find this constellation by using the Big Dipper: just draw the line from the last star in the handle of the Dipper (Megrez) through the star in the bottom of the scoop of the Dipper (Merak). Keep going until you see the two bright stars, those are Castor and Pollux, the two famous stars in Gemini. The parental body of the Geminid shower is a so-called called “rock comet” 3200 Phaeton, an unusual celestial object that demonstrates the features of both an asteroid and a comet. 3200 Phaeton orbits the Sun once every 1.5 years. Its orbit brings it close enough to the Earth to classify 3200 Phaeton as a Potentially Hazardous Object. But don’t worry, it is not planning to crush into the Earth in the next few centuries. In 2017 Phaeton made its closest approach to our planet for the next 80 years. It is going to be awhile before we get the best possible view of this weird object again! Andromedid meteor shower is (or rather WAS) associated with comet 3D/Biela that has been observed since 1772. In 1842/1843 Biela’s comet broke up and kept fragmenting until it completely disappeared in 1852. We could not find any mention of the Andromedids in the literature after 1940. Imagine the surprise of the astronomers when the shower returned on December 3-6, 2011 producing as many as 50 meteors every hour! Moreover, the position of the radiant of the 2011 outburst hinted that the material that showered down on Earth those days was the dust that came from the comet before it started to crumble! Scientists performed numerical simulations of the Biela’s comet. They concluded that the 2011 Andromedid meteors were the dust released from a comet when it approach the Sun back in 1649! They also ran the simulations forward in time and predicted the “weak to moderate activity” of the shower in 2018, 2027, 2034 and 2041 and “moderate to strong activity” in 2023 and 2036. You will find the full text of the paper The return of the Andromedids meteor shower here. Since 2018 is the nearest year on the list, this month we will be able to test their theory! The meteors, if any, will be quite faint. So if you are planning to observe this ghost meteor shower, choose the darkest location possible! The shower will peak on December 5-6. By the way, the International Astronomical Union gave these returned Andromedids a new designation December phi Cassiopeiids. 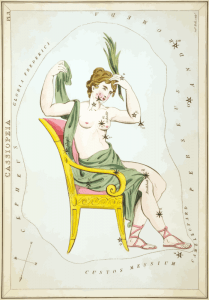 The radiant of the shower lies in the constellation Cassiopeia rather than Andromeda! A number of minor showers will occur this December, the most abundant of them producing about 10 meteors every hour. Ursids, a minor December meteor shower, are active between Dec 17 and 24. The observer will have the best chance to spot the Ursids close to the maximum, December 22, when the most patient of us will be able to spot 10 meteors every hour. These shooting stars seem to come from the constellation of Ursa Minor, the Little Bear. The radiant of the shower lies near the second brightest star in the constellation, Beta Ursae Minoris (remember that Alpha Ursae Minoris is The North Star)! The parent of the Ursids is a Tuttle’s comet. 8P/Tuttle is a short-period comet (astronomers call “short” anything between 20 and 200 years) with a period of 13.5 years. The first direct observations of the comet’s nucleus with Arecibo Radio Telescope showed that it is likely to be a contact binary, which means it consists of two connected lobes. Contact binaries are not unusual space objects, in fact we know many contact binary asteroids. But astronomers seldomly find contact binary comets. Not because they are rare, but because the direct observations of the comet nuclei is not usually possible. The other famous comet that is also a contact binary is 67P/ Churyumov-Gerasimenko, the object that was explored by Rosetta mission in 2014-2016. A few even smaller December 2018 meteor showers will surprise us with 1-5 meteors every hour. Clear skies, warm nights and happy stargazing!